What are the best days for engraver? When a customer comes in and says “Do me something nice on that silver Zippo. I like your scrollwork and just do your thing. I’m sure it’ll be good looking lighter”. 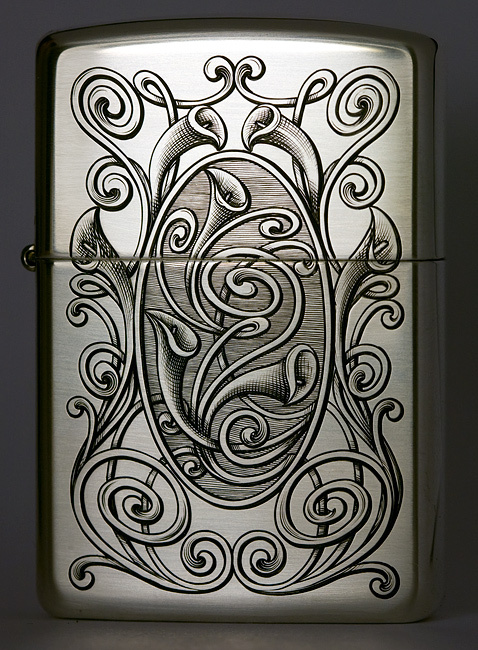 So I get to drawing board, I can try out some new styles, play with ideas for a while and then “do my thing” on a lighter. Sure it can take way more time than allowed by the budget, but it’s fun and I’m always learning new things for the future. One engraving style that has fascinated me since I first saw it, is called “Liberty”. It has quite unique look to it and can be concluded with one work – spaghetti’s. But very beautiful and graceful ones. 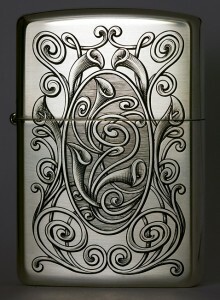 Without further ado, here my next Zippo project on a silver body.